Pertussis (also known as whooping cough) is a highly contagious infection of the respiratory tract. It spreads through droplets when an infected person coughs or sneezes. Pertussis is a cyclic disease with epidemics occurring every few years. Because it can be very serious, it’s important to know when to seek medical care. Babies younger than 6 months of age and preschool-aged children are most at risk. Young infants (under the age of 6 months) often suffer from respiratory pauses and decrease in their heart rate, requiring hospitalization – including intensive care unit admission. Death may occur, mainly in the youngest. Canadian guidelines recommend that all children get four doses of the combined vaccine that includes pertussis protection – at age 2 months, 4 months, 6 months and 18 months. Your child will get a booster vaccine at 4 to 6 years of age. An additional booster dose, combined with tetanus and diphtheria (Tdap) vaccine, is given routinely to adolescents between 14 to 16 years of age across Canada. Schedules may vary from province to province. Calculate your child's personal immunization schedule. There have been many reports of rises in whooping cough (pertussis) cases in Canada and the USA. In the Province of Quebec, at the end of July, 435 cases of pertussis had been reported, compared to 46 for the same period in 2011. Children under a year old were those most affected – 75% of them were aged between 0-5 months old. Only 24% of reported cases had received their complete vaccination series for their age group. Why is this infectious disease making a comeback? First, protection from the pertussis vaccine wears off, making people vulnerable. Although teens get vaccinated in grade 9 (secondary III), most adults don't get boosters; so they can get and spread the disease. The problem with pertussis is that it is usually benign in adults and thus, does not get diagnosed. Also, infants start their vaccination series at two months but are not fully protected until they get their third shot. That being said, they are vulnerable to catch whooping cough from siblings, parents and caretakers who might not even know they have it. Have all infants fully vaccinated with DTaP (diphtheria, tetanus and pertussis) and do not delay vaccination, as infants remain at risk for longer periods of time..
All adults, in particular those who have contacts with young children, should get a Tdap (tetanus, diphtheria and pertussis) booster. It's for kids 11-12 years old; everyone who has contact with pregnant women or infants; women of child-bearing age, before or immediately after pregnancy; and everyone 64 or older who has not had a booster within the past 10 years. 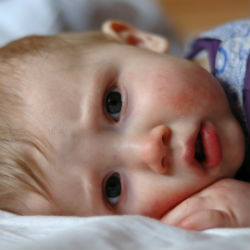 For more information about the symptoms and causes of whooping cough, click here.